mychess0710 has no other items for sale. This amazing pair of Steiner Military/Marine 8x30 binoculars are second to none in terms of their unparalleled quality and superior optics. Portable and compact, take them with you on sporting adventures, hunting expeditions, and boating trips so you can bring all the action a little closer. These Steiner Military/Marine binoculars give you an up close and personal view so you don’t miss a thing. Originally designed for military combat use, this pair of binoculars boasts reliability and crisp vision that you would expect from this leading brand. With a weight of only 18 ounces, this lightweight, versatile pair of high-quality binoculars are convenient to take around with you wherever you go. With a handy design, the binoculars fit comfortably in your backpack or satchel. The coated lenses allow for colors to be accurately magnified without color aberration as well as limit reflective glare. 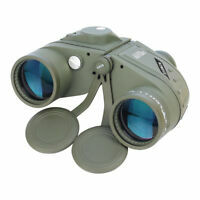 These binoculars work just as well in daylight as they do during nighttime or in dimly lit areas. This makes them a worthy option if you have a multipurpose use for your pair. If you like go out on weekend boating trips or to the seaside with the family, these Steiner Military/Marine 8x30 binoculars are ideal as they are fully waterproof in case of splashes or accidental contact with the waves. Durable and sturdy, these all-weather-capable binoculars provide the perfect solution for varied types of use. The impressive 8x30 magnification gives you a great field of view and an exceptional visual experience. You can see detailed pictures from a distance with the sharp autofocus offered by these Steiner binoculars. You just need to adjust the focus to your desired preference once, and you can enjoy a myriad of detailed views without the need for constant alteration. With a 390-foot field of view, you can bring the objects you want to see into range easily. 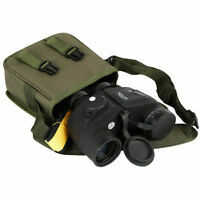 If you enjoy hunting, the Steiner Military/Marine binoculars make a suitable companion for scanning your surroundings. If you’re a regular at sporting events, you can get to the center of the action quickly with these binoculars. They are also perfect to take with you to see your favorite artists perform in concert, and zoom in on the stage if you’re at a distance in the crowd. Birdwatching and stargazing experiences are also taken to the next level thanks to the pristine objective lenses. With a budget-friendly price, these binoculars give you quality optics and clarity to capture memorable views. Steiner has taken its years of experience and innovation to come up with a pair of binoculars that gives you an incredibly sharp view without a hefty cost. The Steiner Military/Marine 8x30 binoculars are designed with an easy-to-hold rubber grip for your comfort and have a 20mm-long eye relief, allowing you to enjoy this quality pair of binoculars for hours. The rubber element also creates a good level of durability in case of accidental drops. Whether you enjoy fishing, hunting, or trekking, a pair of Steiner Military/Marine 8x30 binoculars is the perfect option to enhance your experience. Rugged, lightweight, with bright crystal clear viewing. This is a great pair of binoculars. Rugged, easy to use (no need to focus), lightweight, moderately compact, with crystal clear viewing. What's not to appreciate? It draws in alot of light for its' size. It doesn't draw in as much light as a 50mm lens, but then it's also smaller and lighter. The light it does draw in is quite sufficient for normal use, I just don't recomend it for night. Anything closer than about 15 yards will be out of focus, then from there out its all clear and bright. If you've used cheaper brands before, the image clarity will shock you. You don't know what you're missing. Steiner Quality from the 1970s. These are excellent and very clear binoculars, despite being manufactured in the 1980s. (They still say "Steiner, East Germany) Clearer then any other medium binoculars I have had and sharper then even the 10 power Nikons I have, these are great general purpose for the Boat or car. And they float. I chose the binocular for running hunting, basically in mountains. The binocular should to requirements: good sharpness of the image, brightness, not heavy, convenient in options. Steiner Military/Marine 8x30 Binocular completely to it corresponds. At it a good picture, small weight-520gramm and it is convenient. Function a sports auto focus is well realised. It is necessary to adjust once adjustments on eyepieces and the image will be sharp on a distance from 20м indefinitely. There are small geometrical distortions at edges, but this lack can be neglected. As a whole very good model. Good binoculars!But lens and objective covers must to be better for military binoculars, IMHO. Good in low light condition. Weight and size is good for long hunting trip. For me these binoculars are perfect. The compact size is nice for my lady's small hands, watching birds, fish and other animals, boats, shoreline activities. The optics are very clear and sharp. Even in low light, they allow viewing at a respectable distance. The rubberized protection is also a plus.